When James VI of Scotland ascended the English Throne upon the death of Queen Elizabeth, he immediately moved south, ruling the new United Kingdom of Great Britain from London. Remote control however brought problems, including the need to establish some method of maintaining his authority without being physically present. A keen theologian, he was impressed with the English Episcopal system and saw this as the way forward for Scotland. He felt that control over the clergy would go a long way towards ensuring his wishes were fulfilled. The Scots however, found this an anathema, but were faced with a difficult problem. James was a Stewart, a true Scottish King and as such they did not wish open warfare, yet, whilst historically they were repeatedly willing to suffer discomforts of the body, on religious grounds there could be no compromise. James, ignoring their objections, appointed both bishops and archbishops, granting them seats in the Scottish Parliament. Amongst these were some very peculiar bedfellows, and, as they were largely ignored by the populous, they became sarcastically known as the Tulchan Bishops- a tulchan being a calf's skin stuffed with straw used to induce a cow to give milk. Charles I strengthened his father's ideas, imposing not only Anglican style worship but also a prayer book. This promoted in 1639 a great National Covenant, a declaration, which, whilst condemning Popery, upheld freedom of religion. Thus followed the Wars of the Covenant, not so much battles against the Monarch, but more his policies. Following Cromwell and the Reformation came the 'Killing Times', a period when the Episcopal stranglehold was tightened. Non-attendance at the parish church was deemed an offence with the punishment of a heavy fine being ruthlessly collected by the military. The Covenanters reacted by withdrawing to isolated spots where they held conventiclers; illegal worship presided over by their ousted ministers. Attendance at such gathering was punishable by death, a militia being raised specifically to deal with these groups. The lucky captives were shot, others suffered barbarous torture. Women, it is recorded, were tied to a stake below high water level and mocked as the tide rose to drown them. Some received the Boot, a horrendous bone crushing devise before they were mercifully executed. 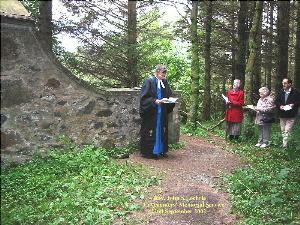 We know little about the two Covenanters buried close to Barrhill village. It is most likely that their only crime was clandestine worship. They were reputedly discovered at New Luce and pursued through the hills before being surrounded at Alticannock. Flushed out, Bibles proved their guilt, so, without formal trial they were taken to the riverside and shot, being left where they fell. Here lie John Murchie and Daniel McIlwrick Martyrs, 1665. Whose blood to Heaven hath a loud cry. The two graves lie alongside a footpath starting close to Barrhill village at a point on the New Luce road where a burn crosses. © Paul Grantham. Last update 2004-02-26.